Sing it with me.... "It's the most wonderful time... of the month!" Ipsy time! My glam bags have been coming at the VERY end of the month for the last couple months. Anyone else getting theirs late, too? Anyway! 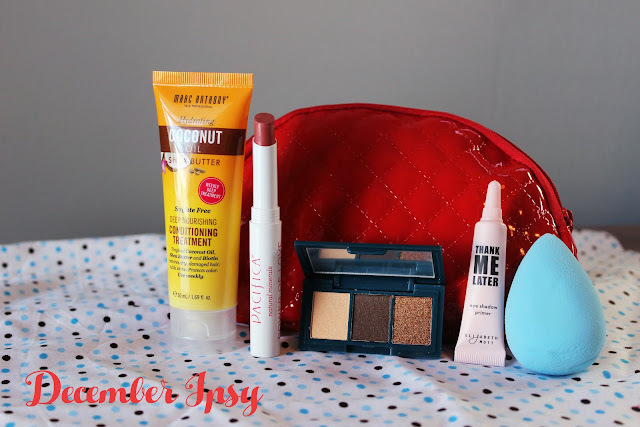 If you're not familiar with Ipsy, it's a $10/month beauty subscription box. You'll receive deluxe sized samples and often times, one or two full size products, too! If you're interested in signing up, click here. Marc Anthony Coconut Oil & Shea Butter Deep Conditioning Treatment: This is a weekly treatment for your hair. It's aimed at you ladies with super dry hair that needs an added boost of moisture. Pacifica Power of Love Natural Lipstick in Nudie Red: This matte lipstick is nearly a my lips but better shade. It's made with coconut oil, shea butter and vitamin E. It's vegan and cruelty-free! Peony Cosmetics Shadow Trio: I'm pretty sure every shadow trio I get from Ipsy has these same three colors. (annoying) ANYWAY... these shadows are created with kaolin clay, which absorbs excess oil. They're paraben free and claim to last up to 8 hours. Elizabeth Mott Thank Me Later Eyeshadow Primer: This primer will help your eye shadow glide on smoother, last longer and stay on crease-free. You only need to use a pea sized amount. RickyCare by Ricky's NYC Classic 3D Blender: This is a knock off of the beauty blender. It's latex free and can be used wet or dry to apply foundation. I tested it, and it's not nearly as good as the Beauty Blender, IMO.